Some Ghanaians for twitter descend heavily on President Nana Akufo-Addo sey he tweet about Notre Dame fire dey console France, but he no tweet about Accra floods wey kill 5 pipo. Notre-Dame fit look rebuilt & finer in five years? 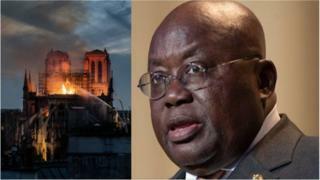 De Ghana President post for en twitter account top say "Ghanaians make shocked about news of de destruction of de Prisian Cathedral, Notre Dame," but de matter no sweet some twitter users who start dey call out de President. For most twitter users, check like de Ghanaian President be quick to console foreign countries when dem suffer accidents den stuff but he no dey sheda care about what Ghanaians dey go through. Heavy rains for Accra on Sunday kill 6 people according NADMO, dis figure dey add to another 5 people wey die last two weeks there. While de Ghanaian President no tweet about de recent flood wey kill people, people bore plus am sey he dey talk sey he make shocked over Notre Dame fire wey no one die. DOES AKUFO ADDO CARE ABOUT FLOODS AND VICTIMS? Recently, Ghanaians dey take on leaders who dey focus on foreign incidents but no dey pay attention to Ghana. Last month people blast Ghana Parliament say dem hold one minute silence for Christchurch shooting victims for New Zealand, meanwhile dem no hold dat one minute silence some give victims of Kintampo accident which kill about 60 people.